Mulberry ( Morus L.; Moraceae), is a fast-growing deciduous woody perennial tree widely present in China, Japan, India, Bangladesh, Pakistan and several other Asian countries. Taxonomically, mulberry belongs to the genus Morus . It is believed that mulberry originated in the northern hemisphere, particularly in the Himalayan foothills, and later spread into the tropics of the southern hemisphere. Today, it is present in all regions between 50°N Lat. and 10°S Lat. from sea level to elevations as high as 4000 m. Mulberry has tremendous economic importance as its leaf is used to rear silkworms, to feed animals and fishes and its fruit is highly delicious and contains a number of health-promoting compounds such as sugar, carbohydrate, alkaloids, vitamins, fats, minerals, amino acids, carotenoids, flavonoids, antioxidants etc. Furthermore, the root and stem bark of mulberry has purgative, anthelmintic, and astringent properties and is also a rich source of phenolic compounds such as maclurin, rutin, isoquercitrin, resveratrol and morin. Mulberry is cultivated as a tree, high bush and low bush under rain fed and irrigated conditions. It is propagated by seeds, seedlings, stem cuttings, saplings and grafting. Considering the great impact of industrialization, urbanization and global warming, mulberry, like any other crops, faces challenges from various quarters. In order to sustain mulberry cultivation to provide continuous income to rural people of several countries, including India and China, it is necessary to develop new mulberry varieties with enhanced productivity and adaptability by employing modern biotechnological tools. 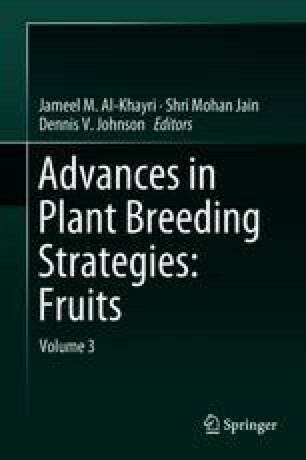 In this chapter, we present an overview of the origin, distribution, taxonomic position, genetic resource characterization and conservation, crop cultivation practices and recent developments on biotechnology, and molecular biology and their application for crop improvement in association with conventional breeding methods of mulberry.